This question can be addressed from two perspectives--what we desire for all students, teachers, and providers of education in general and then specific to mathematics. Various organizations, teachers and students themselves have indicated ways that technology should be used. While the words might differ, there are commonalities among those recommendations. But, the overall reason for using technology in instruction is to reach our ultimate goal as educators, which should be to enhance the achievement of learners. John McCarthy (2018) proposed four categories for how learning can be supported by digital tools: managed learning, orchestrated learning, collaborative learning, and authentic learning. Managed learning involves using management systems and tools to keep track of assignments, grades, announcements, and communications. Orchestrated learning is teacher directed. Per McCarthey,"They structure and provide assignments that students complete to grow academically. The tasks may vary from completing research, virtual lab experiments, posting responses to a discussion board, watching video tutorials, and completing foundational tasks through learning centers or stations." Collaborative learning "is based on where students’ skills are currently, then uses digital tools to support their growth individually and/or through the support of a peer team. Such student-centered work enables the teacher to facilitate thinking and coach growth that is personalized to each learner." Teachers plan the learning experience, but students lead the learning. Use technology linked to district and school initiatives to support learning in the content areas. Integrate technology into the curriculum, rather than making technology a separate subject area. Use technology to assist with data-driven decision making. Use technology to support different learning styles and to meet the needs of all learners, including those with disabilities. Use technology as a vehicle for professional development. Interact, collaborate, and publish with peers, experts or others employing a variety of digital environments and media, including globally. Plan and conduct research, manage projects, solve problems and make informed decisions using appropriate digital tools and resources. ISTE's 2007 National Educational Technology Standards for Students focused on "using technology to learn." In 2016 ISTE revised those student standards to focus on "transformative learning with technology." The seven standards, along with indicators within each, address empowered learners, digital citizenship, students as knowledge constructors, innovative designers, computational thinkers (this latter being a new addition to the standards), creative communicators, and global collaborators. Fostering independent practice of specific skills (p. 9). When used for professional development, "technologies as videoconferencing, online learning, networking, and instant messaging can support professional development and professional learning communities. Using technologies like these, educators can learn and collaborate with peers, mentors, experts and community members routinely. They can build ongoing professional relationships, develop capacity in teaching 21st century skills, benefit from just-in-time communications, and reduce the time and expense of travel" (Maximizing the Impact, 2007, p. 13). Indeed, teachers need more technological skills to be able to effectively integrate technology into classroom lessons, according to the United Nations Educational, Scientific, and Cultural Organization (UNESCO, 2008). 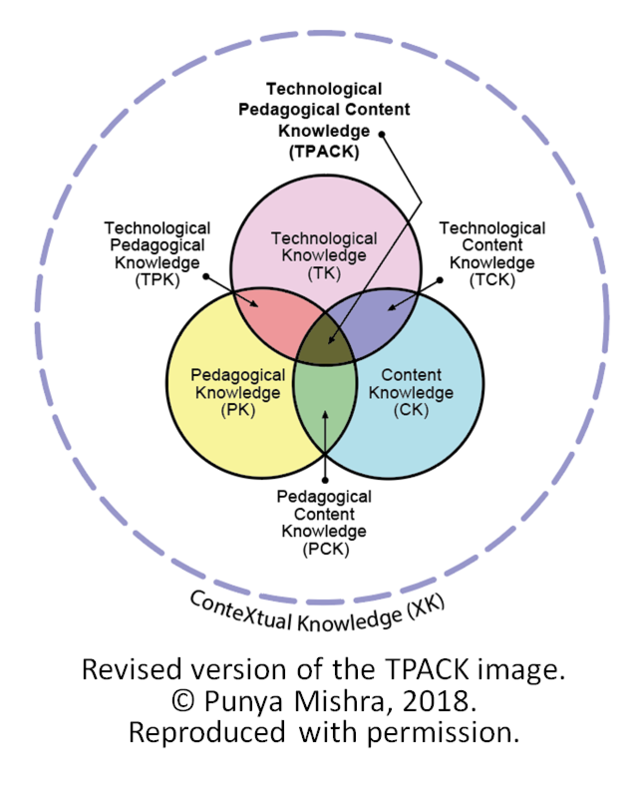 In order to form some consensus about those skills, many of which were noted above, and to determine a plan for their acquisition, UNESCO and colleagues Cisco, Intel, Microsoft, the International Society for Technology in Education and the Virginia Polytechnic Institute and State University set up the ICT Competency Standards for Teachers project. The ICT Competency Standards for Teachers (UNESCO, 2008) includes three booklets: (1) a policy framework, (2) the standards in modular format with a skill set matrix, and (3) implementation guidelines. The latter is actually a syllabus with detailed descriptions of the specific skills to be acquired by teachers within each skill set/module: policy, curriculum and assessment, pedagogy, the use of technology in the classroom, school organization and administration, and teacher professional development. It can serve as a basis for developing professional development programs and teacher education, and as a checklist for skills acquired. Also from a general perspective, district leaders also need to use technology. "Technology can support administration in providing instructional leadership, managing learning environments and professional learning communities, and making decisions that support proficiency in 21st century skills. Networking technologies, for example, can support administrators in communicating with staff members, parents and community members. Data management systems enable states, districts and schools to make sense of the mountains of data they collect, monitor technology and other resources, and track trends in student achievement. In this sense, technology is a “data tool for education to better understand and inform educational and instructional decision making” (Maximizing the Impact, 2007, p. 13). Visit Teaching NOW!, an online television and radio series that investigates the relationships between education and technology. The series, funded in part by the U.S. Department of Education, explores issues, ideas, and strategies surrounding education and teaching. The Center for Digital Education conducts an annual Digital School Districts Survey and the resulting awards "recognize exemplary use of technology by school boards and districts." See district winners and how they are using technology to improve educational outcomes (e.g., data analytics, digital literacy curriculum, 1:1 initiatives, e-learning, and more). Mobile devices have the potential to support learning. Research highlights pedagogy for mobile learning. In their research, Viewing Mobile Learning from a Pedagogical Perspective, Kearney, Schuck, Burden, and Aubusson (2012) characterized the pedagogy of mobile learning from socio-cultural theory, which led to their highlighting three key features of mobile learning: authenticity, collaboration and personalization. "The authenticity feature highlights opportunities for contextualized, participatory, situated learning; the collaboration feature captures the often-reported conversational, connected aspects of m-learning while the personalisation feature has strong implications for ownership, agency and autonomous learning" (Conclusion section). Students have their views on using mobile devices. Access their school’s portal (24 percent) to upload or download information. (Project Tomorrow, 2009, p. 4). Leading educators have views on mobile devices. In their video, Educating the Mobile Generation, Elliot Soloway of the University of Michigan and Cathie Norris of the University of North Texas share their road trip through Texas and Louisiana to see firsthand how mobile devices are being used in schools. Both are convinced it is inevitable that mobile devices will be mainstream in schools. According to Soloway, education in the 21st century will require a transformation from "learning what to learning how." There will be a range in models for change, but its evolution, not revolution. As one interviewed teacher stated, the goal of technology use is for promoting achievement, not to use technology for the sake of technology's availability. This video is in the collection Technology and 21st Century Learning, which is one of three video albums from New Learning Institute. While it might be inevitable that mobile learning devices will become mainstream, as Soloway and Norris predict, there are concerns about permitting their use in schools. Invasion of privacy, cyberbullying, and cheating are examples of misuse. Try a few math apps for your mobile phones. Don't forget this reminder, however: Whenever considering to download any mobile application, you should first evaluate it. Pay attention to who developed the app, and the reviews that the app has received. Read the Terms of Service, as any app for use by learners in your classroom should ensure their security and privacy of any data collected. Also check your school's internet safety and digital media use policy to ensure that the use of the app in your classroom will be in compliance with it. Math4Mobile offers five apps for teaching and learning mathematics on your mobile phone. They are free downloads and you can try them out online before downloading. They are: Graph2Go, a graphing calculator; Solve2Go for equations and inequalities; Quad2Go for learning about quadrilaterals; Sketch2Go, a qualitative graphing tool that includes seven icons to use in sketching graphs; and Fit2Go, a linear and quadratic function graphing tool and curve fitter. Newspapers, books, spreadsheets, graphing programs, calculators, computers, Internet, films, TV programs, Websites, databases, internet and digital libraries can help students gain information and media literacy. They are sources for the study of data analysis. Word processing programs, graphic programs, presentation software, desktop publishing programs can help students gain communication skills. These are applicable for math projects. Word processing software, manipulatives, calculators, graphing calculators, spreadsheet software, probes, GPS, and geometry tool software are useful for developing critical thinking and systems thinking. Use these tools when problem-solving, keeping journals of mathematical experiences, and creating graphical representations of data, for example. Manipulatives, calculators, graphing calculators, Smart Boards, and presentation software help students to develop problem identification, formulation, and solution skills. Digital cameras, laptop computers, multimedia presentation software, graphing calculators, probes/CBRs, Website development software can be used to enhance creativity and intellectual curiosity. For example, students might take photos showing geometry representations in their surroundings and create a math slide show. Calculators, computers, newspapers, Internet, spreadsheet programs, presentation software, video equipment can help build interpersonal, self-direction, and collaborative skills. Students might create portfolios with examples of problem-solving situations in real life, or reflections on their problem-solving and thinking, and their understanding and learning of math concepts. Internet, presentation software, word processing, desktop publishing can be used to communicate with students in other communities or countries, participate in national math competitions, or to discuss concepts with outside experts in online bulletin boards. These become tools for accountability and adaptability. Internet, presentation software, newspapers can be used for community service projects, and for collecting data to be analyzed with math tools and then making reports on local issues. Such use enhances and develops social responsibility. P21 in collaboration with the Mathematical Association of America, NCTM, and dozens of math educators also developed The Math Map (2012), which provides connections between the Common Core State Standards and 21st Century Skills. Lesson plans, learning outcomes, and suggested tools for integrating the skills are provided with examples for grades 4, 8, and 12. Read Dr. Patricia Deubel's commentary "Mobile Devices: Facing Challenges and Opportunities for Learning" featured March 19, 2009, in T.H.E. Journal. Tutorials: Programs are used to introduce math concepts and then to provide practice, assessing learners as they progress. The primary focus is on identification of existing knowledge / formative assessment and acquisition of new information / development of new skill. The secondary focus is on application of new information / practice of new skill and demonstration of mastery / summative assessment. Skill-Building / Drill & Practice: Unlike tutorials, these programs assume learners have some prior knowledge. The primary focus is on application of new information / practice of new skill. The secondary focus is on acquisition of new information / development of new skill and demonstration of mastery / summative assessment. There are levels of difficulty to meet learner needs, often with hints, explanations, and graphical representations. Programs are often in game format. Comprehensive Courseware: Programs provide a core curriculum with support for the learning process and might combine tutorials, practice, and assessment. Skill mastery is tracked; a student data management and reporting system is often included to inform instruction. Problem-Solving: Programs require learners to use specific math skills to solve challenges or puzzles. Focus is on application of new information / practice of new skill and refinement of meta-skills. Problems presented might have one correct answer and/or one solution path or multiple correct answers and paths. Test Prep: These programs assess knowledge, particularly for standardized test preparation. The focus is on application of new information / practice of new skill and demonstration of mastery / summative assessment. Simulations & Visualization: Multimedia simulations are often embedded in applications above, and can also be stand-alone. They can be used to help learners visualize and interactively explore concepts, and apply new conceptual knowledge to real-world situations. Some video-based simulations are less interactive. Focus is on acquisition of new information / development of new skill and application of new information / practice of new skill. Educational or Serious Games: Schneiderman (2006) said this "new category of courseware is emerging designed around more authentic gaming concepts. These applications provide more immediate and ongoing feedback, require more concentrated and lengthy attention, allow repeated practice, motivate increased time on task, and employ a very leveled and contextual approach to building skills and knowledge" (p. 11). The primary focus is on acquisition of new information / development of new skill and application of new information / practice of new skill. Secondary focus on identification of existing knowledge / formative assessment, demonstration of mastery / summative assessment, and refinement of meta-skills. According to Marc Prensky (2005), today's students have mastered a variety of tools and "[e]ducating or evaluating students without these tools makes no more sense to them than educating or evaluating a plumber without his or her wrench" (p. 12). Prensky indicated that their system of communication involves instant messaging, sharing information through blogs, buying and selling on eBay, exchanging through peer-to-peer technology, meeting in 3D worlds, collecting via downloading, coordinating and collaborating through wikis, searching with Google, reporting via their camera phones, programming, socializing in chat rooms, and let us not forget learning via Web surfing. Their tools are just extensions of their brains. The use of these new tools is among trends driving our global economy (Anderson, 2006). These tools "harness the wisdom of the crowd," enable "a shared culture of fandom, commentary, and camaraderie" to be developed, and ultimately are taking the Information Age to a new level, which Chris Anderson (2006) calls the "Age of Peer Production" (p. 132). Although teachers know it's not the medium, but instructional methods that cause learning, some might be tempted to use new media in instruction (e.g., virtual worlds, gaming environments, blogs, wikis, intelligent agents, iPods, MP3 files and players) without a clear plan for an educational outcome. After all, their students appear to have already mastered many of those, as Prensky noted, and are quick to try out new tools as they become available. However, technology should not be implemented just for the sake of adopting technology. It must serve a role in learning. With all the options for using technology, new hardware, software and app products springing up on the market, and schools adopting 1-to-1 approaches to technology integration, decisions must be made carefully when selecting new technology. A primary question deals with vendors' collection of data and how they and districts are ensuring student privacy of data. What is the educational objective? What software meets the objective? What platform(s) run the desired software? His reasons for why this process is important deal with cost and time. "First, these tools are expensive and schools need to get as much use out of them as possible. Second, time in the classroom is scarce, and it needs to be used wisely" (p. 28). Vicki Hancock (1992) discussed the LOCATE Model (learners, outcomes, comparison, assembly, trial, and evaluation) for selecting and evaluating instructional media. According to this model, those who select media should consider the needs of the intended learners, and whether or not the outcomes of instruction require media. Potential media should be compared for authenticity, suitability, organization, technical quality, and special features. The assembly component requires gathering and ensuring that all components (e.g., hardware, software, room/environmental considerations, support staff/volunteers) are available so that the media will be totally usable by the learners. Hancock suggested a trial period before purchase to test the product with learners for their reactions and to determine if the product includes subject matter as intended. Evaluation should include "an appraisal of the materials themselves and of the methods used to integrate them into learning activities" (para. 9). It would also seem wise to consider some basic parameters for selecting applications to help prevent students and educators from becoming "app-a-holics" --a term William Tolley (2015) used for mass accumulation of apps that end up overwhelming students and educators. Tolley noted five parameters to help simplify the selection process. Apps should have direct relevance to class goals, and not be redundant (i.e., don't choose two apps that essentially do the same thing). Apps should be flexible, where possible, in terms of being operable cross-platform and cross-device. They should be authentically useful, which means the best apps are also useful to learners outside the school environment, and have longevity. What is the educational need, problem, or gap for which use of new media might potentially enhance learning? Would the application of new media help learners develop the proficiency they need to acquire the skills of selective monitoring, evaluating, and adjusting their learning strategies? Some call these metacognitive skills. Noel Enyedy's (2014) review of personalized learning revealed a final question to consider in the selection process: Does software align to standards? If you can answer "yes" to one or more of the above questions when considering using a particular strategy or a new media, then your selection has a chance of making a difference in learning. Universal Design and Accessibility are Important. Principles of universal design should also be considered when selecting media for use in an instructional program. Universal Design for Learning (UDL) from the Center for Applied Technology calls for students to have multiple means of expression, representation, and engagement in their learning. Materials provide those elements and have scaffolds built in (Deubel, 2003). The phrase "universal design for learning" occurs multiple times within the Every Student Succeeds Act. For example, local educational agencies are encouraged to "use technology, consistent with the principles of universal design for learning, to support the learning needs of all students, including children with disabilities and English learners" (114th Congress, 2015, Sec. 4104. State Use of Funds, p. S.1177-172). UDL is tied to accessibility. "Accessibility refers to the design of apps, devices, materials, and environments that support and enable access to content and educational activities for all learners. In addition to enabling students with disabilities to use content and participate in activities, the concepts also apply to accommodating the individual learning needs of students, such as English language learners, students in rural communities, or students from economically disadvantaged homes. Technology can support accessibility through embedded assistance—for example, text-to-speech, audio and digital text formats of instructional materials, programs that differentiate instruction, adaptive testing, built-in accommodations, and other assistive technology tools" (U.S. Department of Education, 2016, p. 3). Educators have a legal responsibility to provide accessible content. To illustrate, materials include curricula and resources (e.g. digital textbooks, e-books, online videos), devices include smart phones and tablets, digital tools would include computers, apps, and games, and platforms would include online learning platforms and websites (Center on Technology and Disability, 2016, p. 2, 6). For students with disabilities (e.g., vision, hearing, learning), technology use may pose unintended barriers to learning. "[F]eatures such as text-to-speech, speech-to-text, enlarged font sizes, color contrast, dictionaries, and glossaries should be built into educational hardware and software to make learning accessible to everyone" (U.S. Department of Education, 2016, p. 19). Overcoming barriers also includes providing captioned videos, alt-text to describe images used in websites and e-books, and ensuring content can be read by screen-readers. This latter is a challenge for charts, graphs, formulas in STEM content (Center on Technology and Disability, 2016, p. 3). Regular access to Closing the Gap, a Web site devoted to computer technology in special education and rehabilitation, will provide articles, product information, discussion forums, and other resources of value on accessibility. The Digital Accessibility Toolkit: What Education Leaders Need to Know produced by the Center on Technology and Disability (2016) contains resources, tips, and information to guide educators in taking a proactive approach to accessibility. "The four sections of the toolkit define accessibility and share why this effort is important today, identify the legal requirements for digital accessibility, describe the benefits of digital accessibility, and explain the procurement of accessible technology" (p. 1). Who is using the technology? If you took the technology away, how different would the lesson be? Anderson stated, "Ultimately technology should enable students to do something they couldn't do without it." How much variety with the technology is there? Are students using "different sites, apps, or programs?" What opportunities do students have to collaborate with or through the technology? Steven Ross and Deborah Lowther (2009) indicated a major goal in today's education is preparing students for higher education and careers. Three forms of technology applications show promise for using "technology reflectively and scientifically to make teachers and curricula more effective." These include "as a tutor, as a teaching aide, and as a learning tool" (p. 21). The first two of those help teachers to address individual needs, and the latter can help learners acquire 21st century skills such as "searching the Internet, creating graphs and illustrations, and communicating through multimedia presentations" (p. 21). As a tutor, computer assisted instruction can provide students with extra practice on key skills and content, provide remediation instruction, provide enrichment activities, and provide alternative ways to teach material for deeper learning. As a teaching aide, tools such as whiteboards enable teachers to better orchestrate their lessons; clicker response systems enable timely feedback to questions that teachers pose (pp. 20-21). While the above statement applies to technology use in early childhood programs, the position could be adopted for all learners. I found in my own research that with any educational intervention, the effectiveness of technology depends upon the appropriate selection and implementation of that technology to meet teaching and learning goals. Once selected, technology-use must be a regular, integral part of an instructional program and not viewed as an add-on in order to have a positive effect on achievement (Deubel, 2001). Intervention classes: Technology is integrated into every class. Principal leads change management and gives teachers time for both Professional Learning and Collaboration. (This occurs at least monthly, according to Leslie Wilson (2010), co-author of Project RED). Games/Simulations and Social Media: Students use technology daily. Core subjects: Technology is integrated into daily curriculum. Student-Computer Ratio: Fewer students per computer improves outcomes. As a bottom line, Mark Schneiderman (2004), Director of Education Policy at the Software & Information Industry Association (SIIA), confirmed "education technology is neither inherently effective nor inherently ineffective; instead, its degree of effectiveness depends upon the congruence among the goals of instruction, characteristics of the learners, design of the software, and educator training and decision-making, among other factors" (p. 30). "Proper planning, teacher training, school leadership, technical support, configured hardware, network infrastructure and Internet access, pedagogy and instructional use, intensity of software use" (SIIA, 2009, p. 2) all play a role in an effective implementation. Introduction to the SAMR Model video posted on Common Sense Media. Using the SAMR model to frame how to teach with apps, a post with 21 ways to teach and learn with apps by the TeachThoughtStaff (updated 2018, September 24). Read Dr. Patricia Deubel's commentary "The Great Debate: Effectiveness of Technology in Education" featured November 8, 2007, in T.H.E. Journal. According to David Roh (cited in O'Hanlon, 2009, p. 32), "There are hundreds of reasons why teachers don't want to use technology. "While exact figures of how many teachers are not using technology in instruction are unknown, Charlene O'Hanlon (2009) pointed out that "anecdotal evidence from vendors and school districts alike indicates resistance to technology adoption is still a problem among a significant portion of the teacher population" (p. 32). They will resist if they are not shown the value that a technology will bring to the classroom, and if they are told they must use it and are given a deadline for doing so. Their resistance might also stem from a fear of students knowing more than they do about a particular technology, which might happen if they lack a firm grasp of the technology. In any approach to integrating technology in instruction, O'Hanlon (2009) suggested that teachers need to be able to learn a technology gradually, and be given time to learn it. Comprehensive training from vendors with follow-up professional development and support within the district will help resolve the resistance issue, as will a peer-to-peer mentoring program. If all else fails, districts might even consider financial incentives for learning and adopting the technology. For some, all it might take to convince a teacher to give the technology a try is for them to see how using the technology impacts students, and to witness the excitement of the early adopters. In a nutshell, elementary principal Rob Furman (2013) would most likely call overcoming resistance to technology integration as "Do It on Their T.E.R.M.S." -- a great phrase he posed indicating what teachers need: Time, Encouragement, Resources, Modeling, and Shared success. The following activities should help convince you to give technology a try. See the Technology Integration Matrix (TIM) developed for K-12 teachers in Florida. The TIM has 25 cells created by associating five levels of technology integration (entry, adoption, adaptation, infusion, and transformation) and five characteristics of meaningful learning environments (active, collaborative, constructive, authentic, and goal directed). Each cell includes a link to one or more videos that show technology integration in classrooms where only a few computers are available and/or classrooms where every student has access to a computer. Descriptions of projects learners did and technology requirements are provided so that others might use the same project in their classrooms. Read Michael Orey's (2010) book, Emerging perspectives on learning, teaching, and technology. This 349-page book is freely available online and can be downloaded. It delves into learning and cognitive theories, instructional theories and models, inquiry and direct instruction strategies, motivation, computer mediated instruction, learning communities, reciprocal teaching, technology tools for teaching and learning, and more. Anderson, C. (2006, July). People power: Blogs, user reviews, photo-sharing--the peer production era has arrived. Wired, 132. Hancock, V. (1992). LOCATE: Matching media with instruction. ASCD Curriculum/Technology Quarterly, 1((4), 1-2. O'Hanlon, C. (2009). Resistance is futile. T.H.E. Journal, 36(3), 32-36. Prensky, M. (2005). Listen to the natives. Educational Leadership, 63(4), 9-13. Ross, S., & Lowther, D. (2009, Fall). Effectively using technology in instruction. Baltimore, MD: John Hopkins University, Better: Evidenced-based Education, 20-21. Schneiderman, M. (2004, June). What does SBR mean for educational technology? T.H.E. Journal, 31(11), 30-36. Thornburg, D. (2014). Ed tech? What's the use? T.H.E. Journal, 41((6), 27-30.